St. Martin's Press, 9781250033475, 368pp. There are many ways to die in a hospital…being sick is only one of them. 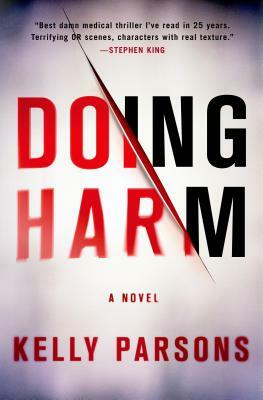 A chilling and compelling thriller that also takes you into the hospital and details the politics and hierarchy among doctors, as well as the life and death decisions that are made by flawed human beings, Kelly Parsons' Doing Harm marks the gripping debut of a major fiction career. KELLY PARSONS is a board-certified urologist with degrees from Stanford University, University of Pennsylvania, and Johns Hopkins, and he is on the faculty at the University of California San Diego. He lives with his family in Southern California. Doing Harm is his first novel.